I know this post has been a long time in coming! What with the holidays coming immediately after the release of The Violinist of Venice, then working on edits to my second book, then doing a few events to promote Violinist, I have certainly been busy. But I did want to blog about the release of Violinist, and what a wonderful and amazing and crazy and stressful experience it was. 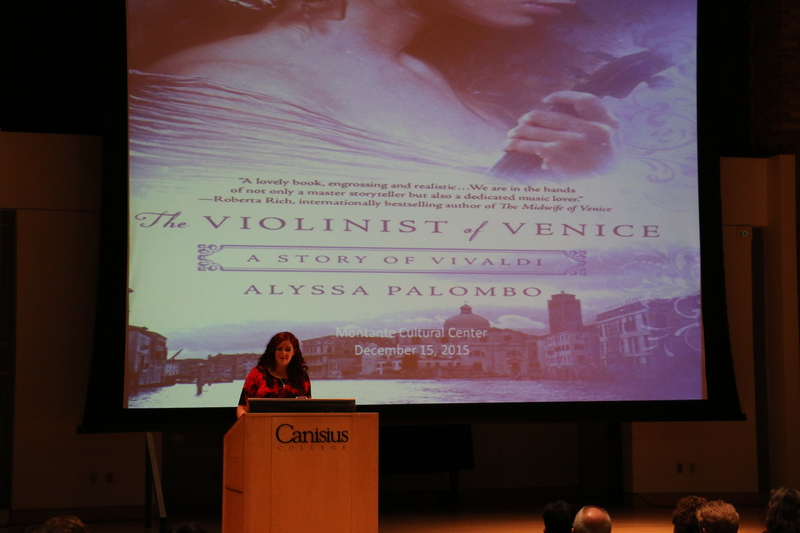 On 12/15/15, The Violinist of Venice’s official release date, I had a book launch party at my alma mater, Canisius College. The head of the creative writing program, author Dr. Mick Cochrane, was kind enough to book the Montante Cultural Center for me. 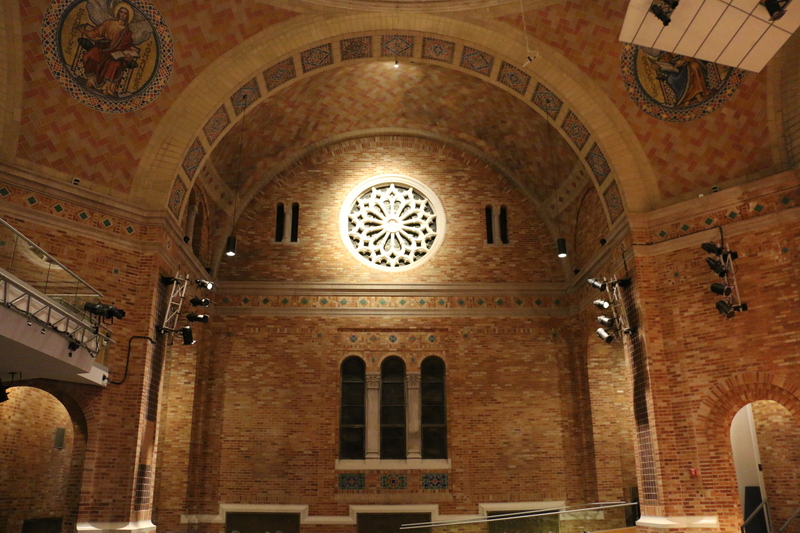 It’s an absolutely GORGEOUS space, and lots of concerts and performances take place there. 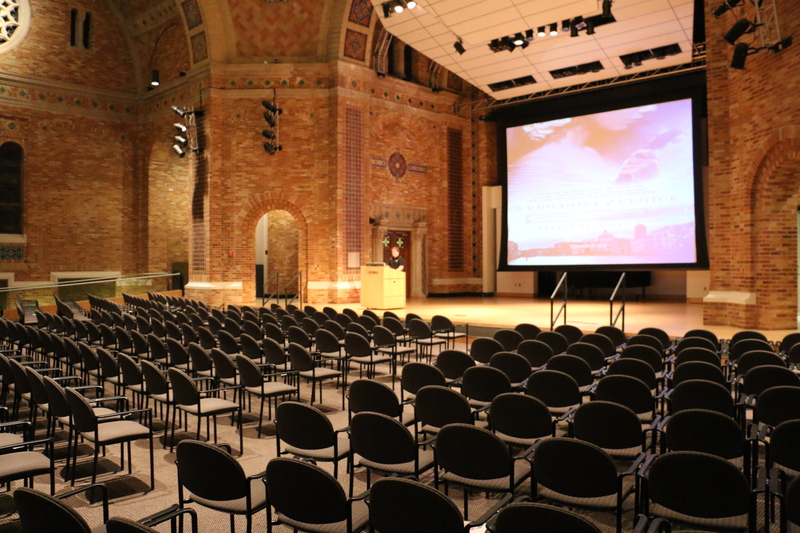 As a student at Canisius I sung many times from that stage – including singing music by Vivaldi. So even though it was a bigger space than I strictly needed, it was so amazing and fitting to have it there. The Montante Cultural Center used to be a church, as you can maybe tell. And they put my book cover up on a screen! Dr. Cochrane introduced me before the reading. 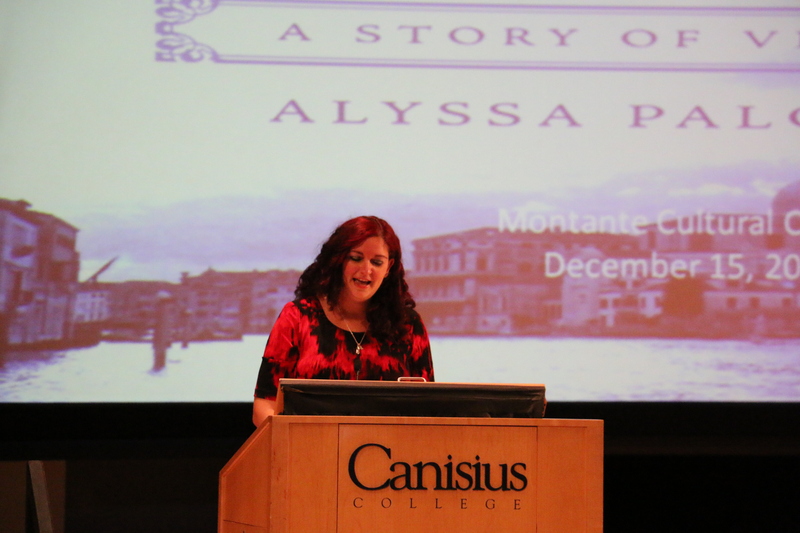 This was another dream come true in and of itself, as he introduces all of the visiting writers who come to speak at Canisius and gives absolutely the best introductions – all the students in the creative writing program aspire to have him introduce them someday, and I was no different. I got pretty choked up during that part, and it just meant the world to me that he did that. Dr. Mick Cochrane introducing me. After the introduction, I got up and read the first chapter of the novel – I felt that, for a book launch where I was introducing the book to the world, it was appropriate to start at the beginning. After reading, I took questions from the audience for a bit. 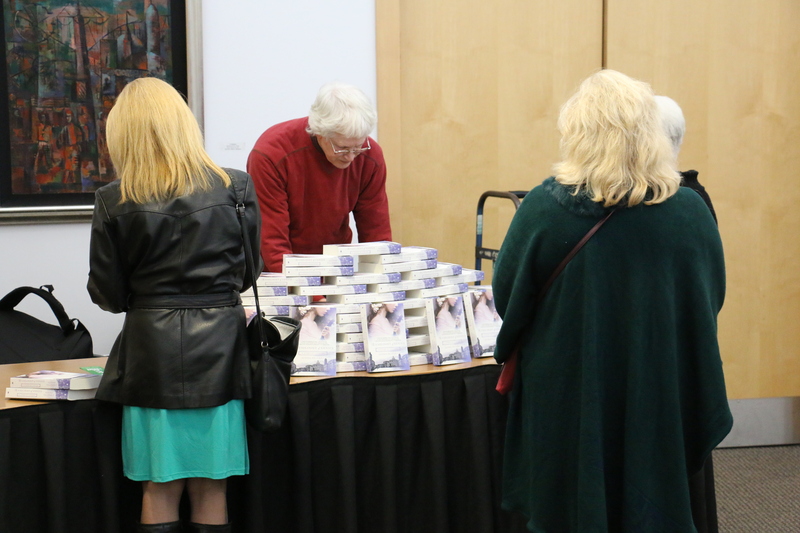 After the reading and Q&A, I went to sign books in Montante’s reception room. Jonathon Welch, the owner of Buffalo’s indie bookstore, Talking Leaves, sold books at the event – he brought 80 books to sell, and sold every last one! Jonathon Welch of Talking Leaves selling copies of The Violinist of Venice. I had quite a long signing line! So many of my family and friends came to the event, and it just meant the world to me that they did. 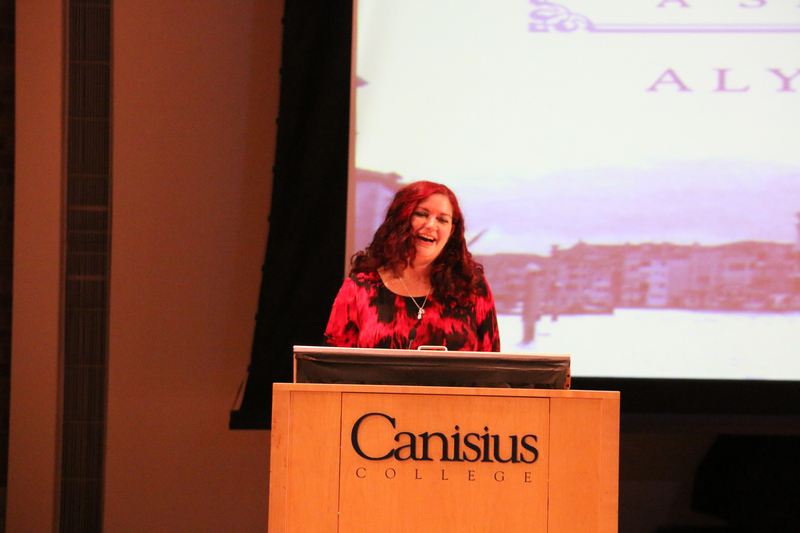 Also really meaningful to me were that some of the teachers who had influenced me the most came as well – my freshman English teacher from high school, my piano teacher from Canisius, and my creative writing professors from Canisius. It was amazing and humbling to have so many people there who were happy for me and proud of me. So far I’ve gotten good feedback on the book from everyone, and that means a lot to me as well! All in all, it was an incredible night, and everything I could have dreamed of. 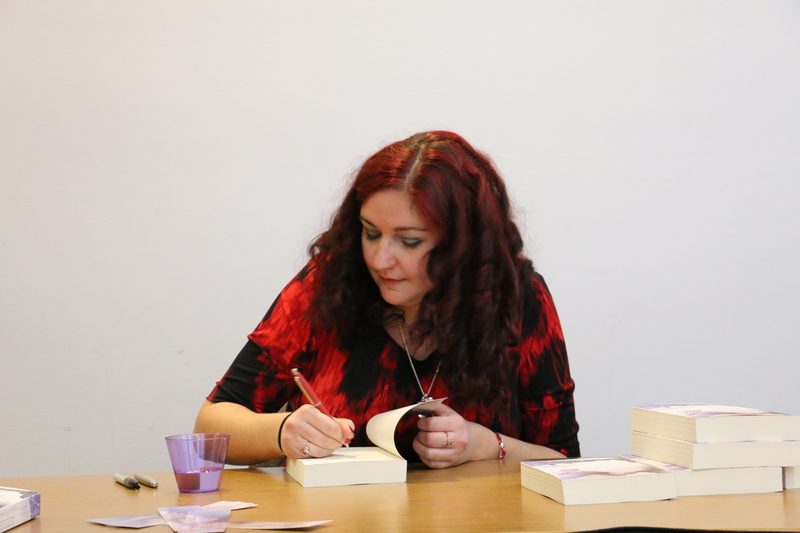 It’s definitely stressful to have a book go out into the world – in the days leading up to the release and after, I was pretty anxious at the thought of the book out there where everyone could read it. 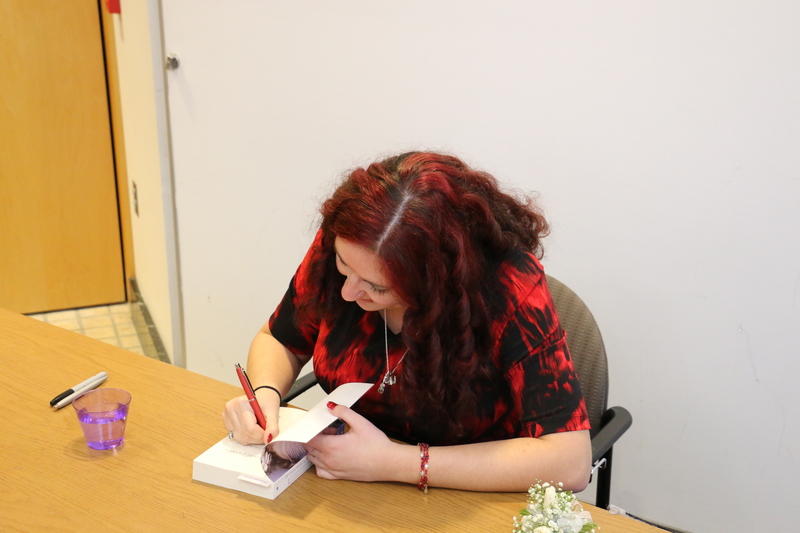 But once I got over that hurdle, published author life has been pretty good, albeit not all that different from pre-published life 🙂 Here’s to The Violinist of Venice, and here’s hoping this is only the first of many book launches in my future! What a fabulous place to launch your book. I went to Canisius about ten years before you and I loved it! 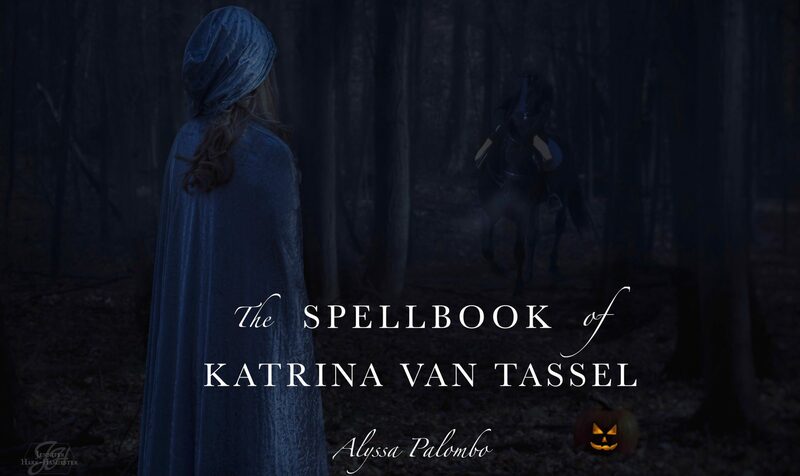 I ordered your book and am looking forward to reading it.